How do you feel about freebies? Gifts with purchase, bonus items, etc. I love getting a bonus something, even though usually it is something that I don't really need or won't really use. The other week as I was shopping at Ulta I got a free gift for spending over $20, It's A 10 Miracle Leave-In Plus Keratin. 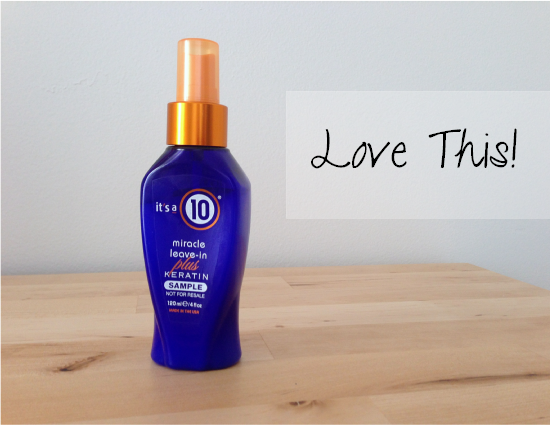 It turns out that this is not one of those products that you don't really use, I'm loving this stuff! From checking out there website it seems that this is a full size product, valued at $20, awesome. The better surprise, it works great too! Its a light weight leave in spray. I spray on a little after showering, before drying my hair and it automatically gives it a more silky feel. It has definitely helped with my never ending frizz. I have naturally curly hair so I feel like I am always combating frizz. I also have pretty fine hair and this doesn't seem to weigh it down or make it feel greasy. It smells nice too, which doesn't hurt. I have used it for a couple weeks, and plan to continue to do so. I am curious to see how long this 4 oz. container lasts. It is definitely a product I can see myself purchasing once I run out, good thing it came with a $5.00 off coupon! Do you have a favorite freebie you've received lately? Stay tuned for the next stop on the House Tour tomorrow!